← What is a good Christian book? This idea might scare you. Maybe you’re asking yourself, “But aren’t spiritual disciplines for monks, saints, and religious fanatics?” John Ortberg would respond with a resounding “No!” That’s why the tag line for this book is “Spiritual Disciplines for Ordinary People.” This isn’t the first time that the subject of spiritual disciplines has been taken up to promote spiritual growth. For instance Richard Foster wrote a book some years ago, Celebration of Discipline: The Path to Spiritual Growth. And Dalas Willard wrote The Spirit of the Disciplines. (I hope to review both before too long.) 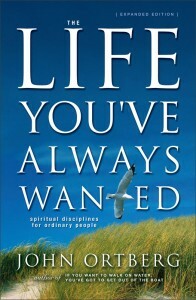 But John Ortberg ’s book, The Life You’ve Always Wanted, is certainly one of the most readable and easy to understand. The first two chapters put forward the idea that the goal of a spiritual life is to change, to become more like Christ. Then in the third Chapter John Ortberg reveals the secret of spiritual disciplines. Most of us think that when faced with a spiritual challenge we simply need to screw up our will and try harder. Ortberg points out that no matter how much we want to run a marathon, and no matter how hard we try to run it, we will not successfully complete a marathon without training for it. You start out running only a few miles a day, but each week you run, you become stronger and are able to run longer distances. And if you keep at it you will eventually be able to run the full 26 miles. The same principles apply to our spiritual race. The role of spiritual disciplines is to train us to meet the spiritual challenges that will eventually come. The next ten chapters then set out ten ordinary spiritual practices. Some of the practices come as no surprise. For instance John Ortberg covers the practices of prayer, servanthood, confession, and reflection on Scripture. Some others are a bit more surprising. The first spiritual discipline he handles is the practice of celebration. Also included are the practices of “slowing,” secrecy, and receiving guidance from the Holy Spirit. Ortberg ends the book with an important chapter on living a life of endurance and the experience of suffering. Although I had read both Celebration of Discipline and The Spirit of the Disciplines I found this book very helpful in putting feet to the disciplines in my own life—chapters three and thirteen were especially meaningful for me. This book comes with a small group study guide, written by Kevin G. Harney, as an appendix. Scripture readings, discussion questions, opportunities for reflection, and life applications are provided for each chapter. If you would like a more substantial curriculum, one that could be used for a larger class, a video curriculum The Life You’ve Always Wanted Curriculum Kit: Six Sessions on Spiritual Disciplines for Ordinary People is also available. Rob has been working in churches and in the ministry of Christian spiritual growth for the last 28 years. Rob became convinced that God wanted him to take the “know how” that he had gained from 28 years of ministry and use it to help churches have effective education ministries. This entry was posted in Christian book, Curriculum and tagged Christian disciplines, Christian maturity, Christian spiritual growth, How do I grow spiritually, John Ortberg, spiritual disciplines, spiritual growth, spiritual maturity. Bookmark the permalink. Please support us! Like it, share it with your friends, add your name to our mailing list, and purchase your books and curriculum here. Thanks for the support! What is a good Christian book?